Even though my day isn’t going completely as planned, there are some things happening today that are quite awesome. The lovely folks at knomo have given me one of their laptop bags to give away to a lucky reader! And it’s a limited edition colour: Raspberry. Pretty, right? The colour isn’t even available anymore in stores, so it really is a special sleeve! 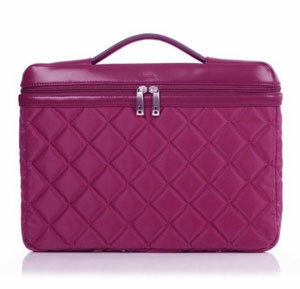 It’s for a 15″ laptop (37x27x4 cm or 14.6×10.6×1.6 in) and comes with a detachable strap. I reviewed this bag some months ago (read here): it’s somewhere halfway between a sleeve and a real laptop bag. There’s a main compartment for your laptop and a side pocket for your cables, adapter and other stuff. To enter this giveaway, leave a comment behind with what you favourite post of mine has been. You’ll also get a second entry if you’re following me on Twitter and tweet about this giveaway with the hashtag #missgeeky. The competition ends on March 1st 15:00 after which I’ll randomly draw a winner!